The release of Deathly Hallows in 2007 brought about mixed feelings. On one hand, several questions about the series would finally be answered in this final book. On the other hand, Deathly Hallows would mean the end of Harry Potter, together with the thrill of speculating and theorizing. Nevertheless, it was a great excuse for Blooey and I to do some crazy things only rabid Potter fans were capable of doing. 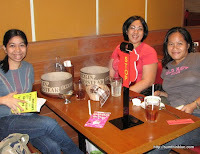 The day before the release of Deathly Hallows, we’d attended a press party hosted by Powerbooks to celebrate the book’s release. Blooey and I dressed up as Luna Lovegood and Tonks, respectively. As if donning a blond wig, a lion-topped hat, a purple hair-lined hat and robes weren’t enough, we even joined the trivia contest and won (naturally) – even if it meant beating a 12-year old girl to the buzzer. As we got home that night, I could barely sleep from the excitement of finally being able to read Deathly Hallows. After seven years of waiting, this was the culminating moment for any Potter fan. We arrived at the Powerbooks Greenbelt branch the following day at around 6:30 AM. To my surprise, a long line of Potterheads had already formed outside the bookstore. Several more people fell in line behind us, and a few minutes before seven, the line was twice as long as we had found it. To show our support for our favorite character, Severus Snape, Blooey and I wore matching custom-made black shirts bearing the bold statement, “In Snape We Trust”. Despite the ending of Half-Blood Prince, I never doubted Snape’s true nature. When I finally got my copy of the book, I actually felt shivers up my spine. I stared at it for a couple of minutes as I held it in my hand, savoring the last few moments of anticipation. As I skimmed through the Table of Contents, I would occasionally squeal at titles like, “The Life and Lies of Albus Dumbledore”, “Godric’s Hollow”, and “The Prince’s Tale”. I read the book continuously, and finished it a little after midnight that day. I don’t think I’ve cried harder while reading any other book. Deathly Hallows was a very bittersweet read. There was so much nostalgia in the scene where Harry was packing his things before he would finally leave the Dursleys. It felt like an allegory for all the fans’ memories of the books, and as he shut his trunk, it bore the unmistakable message that this was really the end. Throughout the book, there were so many deaths and so much suffering, but what touched me more was the courage Harry and his friends had shown, even if it meant giving up their lives. Themes of heroism have always been part of great literary epics, but J. K. Rowling’s genius lies in her ability to make us completely relate to the characters and feel their burden. Their flaws and shortcomings only make us love them more, as best exemplified by Severus Snape. I was sobbing throughout the entire chapter of The Prince’s Tale. Even the previously-omnipotent Dumbledore broke away from his archetypal shell and was exposed as an old man with Machiavellian ideals. I especially loved how Rowling handled the ending – how Voldemort was killed by his own hand, and how Harry never has to resort to killing to triumph. Deathly Hallows, to me, will always be a reminder to have hope, faith, and to believe in the power of sacrifice and redemption. A few days later, Blooey and I were discussing the book when we came up with another crazy idea. Why don’t we throw a party for Harry Potter? (Never mind that he’s fictional!) What actually was a spur-of-the moment thing became one of our most elaborate theme parties ever. Never mind that it was shifting exam week or that we only had one week to prepare. We researched on Hogwarts and British recipes, and came up with our own version of butterbeer, transformed book covers into Hogwarts textbooks, created a Snitch cake, printed an issue of the Quibbler, suspended candles over the dining area to resemble the Great Hall and basically transformed our living room into Hogwarts. Looking back, I can’t believe how much energy we spent to celebrate a party for a fictional character! The guests were all great sports – among the characters present at the party were Harry Potter, Bellatrix Lestrange, Sibyll Trelawney, Dolores Umbridge, Rita Skeeter, a couple of Slytherins, and the Golden Snitch. We also had a Horcrux hunt. To this day, however, Slytherin’s locket remains missing. A Very Harry Birthday -- Food, Glorious Food! Deathly Hallows marked the end of an era, as it was the definitive end of the Harry Potter series. But J. K. Rowling didn’t stop writing. In 2007, she unveiled 7 handmade copies of The Tales of Beedle the Bard, six of which she gave to the people who were most involved in the Harry Potter series. The seventh was auctioned for charity, and Amazon had the winning bid. Eventually, the book found its way to commercial publishers and a more affordable edition was made available to the public. When it was released in the Philippines in December 2008, Powerbooks Greenbelt held a special midnight sale, which Blooey and I attended. Sadly, only a handful of Potter fans were present (there were only about a dozen, I think). So what’s next for this Potter fan? As Rowling is still working on her “Scottish book”, I’ve been continuously reading other books, looking for the next best thing. Though I’ve discovered several incredible works throughout the past couple of years, none of them has had me as emotionally affected. I’m currently building a collection of international editions of Harry Potter books – US, UK Children’s, UK Adult, French, Spanish, Portuguese, Japanese, Chinese, Italian, Polish, Ancient Greek, Latin, and Irish editions have all become part of my library. To date, I have around fifty versions of the books. Most of them were acquired through through Bookmooch and through my travels. This is probably the longest post I’ll ever write in my entire life. Then again, a couple of pages can hardly describe ten years of being a Harry Potter fan. Today, July 31, 2010, I raise my goblet of butterbeer to Harry Potter – the Boy Who Lived (and will survive to old age surrounded by ginger-haired grandchildren) and J. K. Rowling – the woman whose words brought him to life. I can still remember the exact day ten years ago when I first picked up my first Harry Potter book. I was at a Hong Kong bookshop, browsing around for a book on which I’d spend my remaining HK dollars. I spotted an interesting-looking cover depicting a bespectacled boy with a lightning-shaped scar on his forehead, standing in front of a scarlet steam engine. Back then, I had absolutely no idea who he was, or how famous he’d become all over the world. After skimming through the first few pages and giggling over the name Albus Dumbledore, I eventually found myself completely absorbed in the story. I finished it and marveled at how it was unlike any other book I’d read before. I was in fourth year high school back then, and it was a time when romance-novel swapping was rampant. I decided to introduce something else to the book-swapping pool, and before I knew it, Harry Potter and the Philosopher’s Stone had made its way to at least fifteen readers. When it was finally returned to me, I was very much creased and battered. Harry’s fanbase began to grow in the classroom, and eventually, Chamber of Secrets and Prisoner of Azkaban (courtesy of Mika) began circulating among us as well. That year was also the year when Goblet of Fire was released (June 2000). Not being able to stand being at the back of the waiting list for Mika’s book, I immediately got my own copy within the first week of its release. The saleslady told me how lucky I was, because there were only about eight copies left at the store during that time. Goblet of Fire, despite its Flints and plotholes, was just as good as its predecessors. The only thing that ruined the experience for me was hearing the spoiler about Cedric Diggory’s death. Goblet of Fire, despite its length, left me hanging at the ending, and I wanted to read more. Unfortunately, Order of the Phoenix was not released until three years later. During the long, agonizing wait, my fanatacism only grew. Together with Blooey and Mika, we created the original Pinoy Harry Potter mailing list (now inactive) where we sorted members into Houses. We re-read the series, nitpicked, and speculated. “Snape is a vampire” and “Dumbledore is evil” were among my favorite theories. By 2003, so much hype was generated over the release of Order of the Phoenix, that bookstores started accepting book reservations. It was the first time I’ve ever seen people pay for a book before it was even on the market. To coincide with the midnight release in the US, Page One bookstore (there used to be a branch at Rockwell), promised to open at 7 AM on June 21, 2003. After convincing Fritzie to join me for this insanely early book release, I was at Rockwell before the store even opened. I spotted a couple of fans in robes walking outside, and I knew that I wasn’t alone in this madness. I’d reserved my copy of the book earlier, and then later on realized that I didn’t need to, because there was clearly an overabundance of copies. Immediately after paying for the book, I began reading it and was completely surprised at how the tone of the series had drastically changed – Harry had become the epitome of the emo, moody teenager. I finished the book in a couple of days, and mourned the death of Sirius Black for about a week. That November, my mom and I went on a European pilgrimage, and London was our last stop. Knowing that no Potter fan’s visit to London would be complete without a visit to the famous train platform, I got myself a map of the London Underground, and figured out the way to King’s Cross. Apparently, there was an official “Platform 9 ¾” located between platforms 9 and 10. I had my picture taken there, and inside King’s Cross, where they filmed scenes from the film. I was also able to buy the hardbound UK adult edition of Order of the Phoenix at Waterstones, and a Harry Potter marionette in Prague. 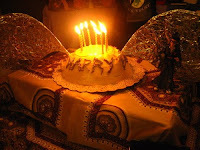 When we got back home, we decided to throw a Harry Potter-themed birthday for my younger brother’s seventh birthday. We had less than a week to plan and work on everything, but the décor turned out great. A Styrofoam Hogwarts castle filled the stage, a foam Hogwarts Express decorated the wall, and there were hourglasses with paper jewels for the House Cup. We sent out scrolls of invitations (printed in green ink) and guests showed up in wizard costumes. We sorted kids into Houses, held a House Cup, and Gryffindor won. I wouldn’t have done it without the help of my friends (the girls from Coolbeans and Canz) and other incredibly talented people. I am forever grateful to them for that. In May 2004, the movie of Prisoner of Azkaban was released. Disappointed by the previous two movies’ gross disregard for many things that actually mattered to the storyline, I decided to give the movie franchise one last chance. I was pretty excited when I heard that Alfonso Cuaron was directing the movie, because I absolutely loved his adaptation of A Little Princess. Unfortunately, despite his stunning cinematography and more “mature” portrayal of the trio, the movie completely lacked the emotional impact of the book. After that, I vowed never to watch a Harry Potter movie again. The year 2005 saw the release of Half-Blood Prince. Again, I was one of the early-bird fans waiting outside Powerbooks on July 16, 2005. Others may have found this book “slow” and even “not as memorable” as the others. But to me, the nuances of Half-Blood Prince could only be appreciated by true fans who have, throughout the years, understood the complexity of the characters and their interactions with each other, and how these have shaped the events in this book. There might have not been as much action compared to the other books, but I really appreciated the exposition of Voldemort’s past. Chapter 2, Spinner’s End, is probably one of my favorite chapters in the entire series. As someone once said, Bellatrix is the fans’ envoy in this chapter. I really enjoyed seeing her bombard Snape with questions that fans have long wanted answered. I was supposed to blog about FFP's July book discussion, but a recent entanglement with Fully Booked has prompted me to write about something else. For their third anniversary, the Fully Booked branch at Bonifacio High Street decided to hold a sale on July 25-29, 2010. This meant 80% off on selected items and 20% off on the rest of the books. The first two dates were specifically reserved for Discount Card Holders, and the succeeding ones were for Facebook fans and Twitter followers. I was surprised at their sudden decision to make the sale exclusive, because no such conditions existed the previous year. Last year, I was able to make it on the last day of the sale, and was still able to get a load of really great bargains. Nevertheless, I followed this year's rules. Being a Facebook fan, I emailed my contact details to Fully Book's marketing department, and received a confirmatory email that would allow me to avail of the discount on July 27-29. I printed the email, and was all set. Or so I thought. I arrived at the Fully Booked High Street branch a little after lunch, and began browsing around. This year's 80% off selection was definitely not as good as last year's. There were less titles to choose from (only the middle area of the Atrium was occupied), and there weren't many books that were of interest to me. I remember during last year's sale, my plastic cart was almost overflowing with brand-new hardbounds. And this year, it seems that they wanted to get rid of all their damaged non-book merchandise. I spotted several diaries and moleskines (all defective, with missing straps and whatnot), and even a Lightwedge booklight (minus the battery cover and cloth casing). Not being satisfied with this part of the sale, I decided to take advantage of the 20% discount to buy books on my wishlist. With a bagful of books, I walked over to the cashier, presented the printed email and began to unload the books on the counter. When I brought out my gift certificates (I still had P9,000 worth of GCs for being first runner up at February's Book Geek), the cashier started to frown at me and told me that they we previously instructed not to receive gift certificates as payment during the entire duration of the sale. Which is completely absurd. Nowhere in the conditions (clearly printed at the back of each GC) was it stated that GCs cannot be used in conjunction with other discounts/promos (with the exception of the Fully Booked Discount Card, which was an automatic 10% off). Technically, they were as good as cash. Blooey had already warned me earlier about this. Last Sunday, she went to the sale (exclusive for Discount Card holders), and was also told that her GCs would not be accepted. I think they were trying to point out that the discount card can't be used together with the GCs, as stated in the conditions. However, Blooey defended that, technically, she wasn't using the Discount Card (if that were the case, then she should have a 30% discount - from the sale's 20% + from the Card) and it was only used as a means to identify Card Holders who were entitled to the sale. After some threats later, the staff decided to back down and allowed her to use her GCs. "Be prepared to defend yourself at the counter," Blooey texted me that Sunday. Today, I was faced with the same dilemma. This time I didn't even have a Discount Card, so there were absolutely no grounds for not permitting me to use my GCs. I told the cashier that my cousin was able to use her GCs just Sunday, and they lamely told me that they made an exception for her. I pointed out how inconsistent they were, and demanded an explanation on why I can't use my GCs. The girl at the counter excused herself, probably to call on some higher powers. She was away for a good five minutes, and I was really holding up the line of people who were waiting to pay, which was really embarrassing. When she finally came back, she informed me that they'd accept my GCs. Just like that. This is actually not the first time I've had this sort of encounter with Fully Booked (specifically with the High Street branch). And frankly, it's starting to become tiresome. Fully Booked could be a great bookstore if they just treat their customers with respect - after all, without book lovers, they wouldn't even exist. I still have a bunch of GCs left, but once I've consumed them (but definitely in some other Fully Booked branch), I don't think I'll be purchasing anything else from Fully Booked. Thank God for Book Sale. And for the small secondhand bookstores. The challenge was simple: visit 5 Book Sale branches on a P500 book budget. They didn’t believe we could do it, but Blooey and I believed that we had more willpower than most Flippers give us credit for. Using the MRT line as our guide, Blooey and I mapped out our route. We initially considered SM North Edsa as our starting point, but we realized that we really didn’t feel like weaving our way through 3 huge buildings just to find a Book Sale outlet. We finally decided on using Cubao as the first stop. Our route was thus: Cubao (Farmer’s Market) ---- Megamall -- Edsa Central -- Magallanes (Alphaland)-- Makati Cinema Square. After donning a pair of durable flip-flops and packing an extra plastic bag for my books, I picked up Blooey at around 10 AM last Saturday and we set off for Ayala Station. We were supposed to meet Marie, another Flipper, at the station, but Tattie had a lunch date with one of her friends in the Cubao area so we told her we’d meet at Farmer’s Market. I’ve never been to the Book Sale branch at Farmer’s Market (I didn’t even know there was one! ), so I was pretty excited. The store was located at the ground floor, and it had a nice, spacious layout that allowed one to rummage through the piles without obstructing the way. I’m officially a bum at present (i.e. still studying for this August’s Board Exams), so I always try (albeit sometimes unsuccessfully) to minimize my book expenses. P40/book (paperback) is really my limit, unless it’s a book that I really, really want. Or a book that’s unlikely to be seen again anytime soon. And since it was only the first stop, I didn’t want to spend too much. Iwas able to buy Masters of the Macabre (a collection of classic ghost/horror stories with illustrations) for P20, The Monster at the End of this Book for P15 and a silly, useless book entitled Well Blow Me Down: A Guy’s Guide to Talking Like a Pirate, which was autographed and priced at only P5. Not a bad start. Marie eventually joined us shortly after. Our next stop was the Book Sale branch near Shopwise. This store had a more extensive collection of picture books, several of which were really over my budget. I saw a copy of Maurice Sendak’s The Night Kitchen, in very good condition. But at P140, it was still too steep for me. There was also a copy of Zathura by Chris Van Allsburg that went for P65, but the dust jacket was torn and tattered. There was also a copy of O. Henry’s Gift of the Magi illustrated by Lisbeth Zwerger, but it sold for P130, and was not in very good condition. Filled with longing and regret, I walked out of the store empty-handed. Marie told us that there was this surplus/secondhand shop nearby that also carried used books. Located across Cubao Expo, MSM Surplus USA was an interesting place that carried everything from board games to parachutes to hand-cranked ice cream makers. Blooey and Marie headed for the toy section first, but I immediately made my way to the back of the store, which was lined with bookshelves. It was really difficult to browse through the titles, as there was no organizational scheme whatsoever. Mass market paperbacks of popular titles were interspersed between old hardbounds, reference books, children’s books and other miscellaneous volumes. Having said that, I was really lucky to find a copy of Ken Follett’s Pillars of the Earth (the Deluxe Paperback edition), which was priced at only P100! It was little worn, but still in quite good condition, with no foxing or yellowing of pages. The book was 900 pages long, and I realized that I needed to start reading it soon to be able to finish in time for the September book discussion. Incidentally, I also spotted a hardbound copy of Harry Potter and the Sorcerer’s Stone, also priced at P100. Aboard the MRT, we decided to bypass Megamall, since the store was quite far from the station. We then made our way to Edsa Central, and discovered that the Book Sale branch had moved from its outside location to the inside of the mall. The store was now located at the ground floor, near the escalator. The inside was nice and roomy, where you could sit and browse the bottom bins. Unfortunately, there weren’t any titles that looked particularly interesting to me. Blooey and I were also starting to see a pattern. It seems that Book Sale recently acquired a new batch of overstock books, of which each branch seemed to carry several copies. Just when I was about to give up, I spotted a hardbound copy of the fourth book in the Hermux Tantamoq series, Time to Smell the Roses by Michael Hoeye, priced at only P20! It was a steal! Now I only need the third book to complete my collection. Blooey, again, wasn’t able to buy anything. And Marie, despite us tempting her with several crochet books, firmly told us that she wasn’t buying books today. Of course, we didn’t believe her. Blooey was starting to feel depressed about not buying enough books yet, so we decided to check out the Book Sale branch at Star Mall (AKA Jejemall). The building was deceptively far, and we had to climb up and down several flights of stairs and cross several walkways to get there. After stopping for a quick Strawberry Scrambol break (yum), we finally made it to the store. This particular Book Sale branch was so cramped and jumbled. Blooey and I started to browse through haphazardly piled books in the bottom bins, but soon gave up after fear of creating a much bigger mess. Luckily, she was able to spot a brand new copy of The Demigod Files by Rick Riordan, which was priced at only P120 (from the original P500+). I was also able to buy a copy of A Christmas without Elizabeth from the SVT series (which I’m trying to rebuild, after inexplicably losing most of my books in high school). Afterwards, I settled in a corner browsing through this big glossy book on Broadway musicals, which was really fascinating (but expensive), as Blooey and Marie continued to look around. Our next stop was Alphaland (another mall I never even noticed) at Magallanes. I don’t know if it’s just because we’ve been to so many Book Sale branches today, but it seems that each store carries a lot of titles similar to the previous one. Long story short, I wasn’t able to buy any books here, but I did get a couple of very interesting back issues of a food magazine called Cook’s Illustrated for P35 each. It had a lot of cooking techniques I haven’t read about before, all illustrated in an old-fashioned pen and ink style. There were also comparisons of “ordinary” food items (which can turn out to be extraordinary) like vanilla ice cream, cuts of beef, and chocolate cupcakes. They also reviewed and compared kitchen gadgets like food choppers and waffle makers. I was so absorbed in reading that Blooey convinced me to buy them. We had dinner at Sizzling Pepper Steak, the less expensive knock-off of Pepper Lunch. Marie successfully ordered a “student” meal after showing her old UP I.D. Blooey had the Curry Pepper Beef and I had the Pepper Beef with Mushroom Gravy. The food was not bad, but nothing extraordinary either. The beef was quite tender, but then again, it was thinly sliced, like sukiyaki-style. I had to ask for extra gravy (which they provided without additional charge) to augment the flavor of the dish, which starts to taste one-note when you continuously eat it. Feeling much more energized, we made our way to the last leg of the Hunt. Blooey and I have always loved the Makati Cinema Square Book Sale. However, gone were much happier days when we used to walk out with an armload of books, each not costing more than P20, and grinning from ear to ear. Lately, the MCS branch doesn’t seem to carry these cheap copies anymore, but occasionally, you stumble upon something good. Like the First Aid USMLE Step 2 reviewer I got for only P45. Though it was an older edition (released in 1999), it still looked useful. I was able to buy the Step 1 version earlier at Book Sale Megamall. I like this particular set of reviewers because it offers concise information and provides mnemonics and buzzwords. Anyway, I didn’t have much luck in the fiction section. There was a hardbound copy of The Penderwicks, which I really wanted to buy, but it was priced at P100+. I reluctantly had to pass it up. It has been a very, very tiring day. I walked for more than 6 hours, and my shoulders were burning from the ever-increasing weight of my book bag. But was it all worth it? Well, today was definitely not one of those “Oh my God, we hit the mother lode!” days. All in all, I wasn’t too disappointed with our Book Hunt. I was able to visit several branches I’ve never been to before, which was pretty exciting as each store came with the thrill of the unexpected. Blooey and I are planning Book Sale Raid #2 – Book Hunting in Manila. Included in the list are SM Manila, Times Plaza, Rob Place Ermita, Pedro Gil and MOA. But I think I need some time for my feet – and wallet – to recover. I can't believe it's already been a year since I last blogged. I've been so busy for the past year that I've rarely been able to visit Book Sale and my usual haunts. Now that the craziness of internship has finally ended, hopefully I'd be able to update this blog more regularly. I was only able to visit 3 secondhand bookshops during my stay in Hong Kong. The following stores all sell new books, although some have bargain sections. This is definitely one of the most comprehensive bookstores in Hong Kong. If you're looking for a book, chances are, you'll find it here. In addition to to the usual general fiction, they have tons of books on graphic design, art, photography, travel and fashion. Some hardbounds are published by and exclusively distributed by Page One. They also carry an extensive selection of cookbooks, and have shelves devoted to new age/spirituality books, books on health, sports and parenting. Their children's section is also quite big, and includes not only fiction, but activity books, reference books, picture books, pop-ups, comics, and graphic novels. About 25% of the store is dedicated to books printed in Chinese. Price range: All books are sold at full price. Visit the Page One website for a complete price list. Overall: Carries a wide selection of books on just about any topic. Too bad they don't have a bargain section. Like Page One, Swindon is a big bookstore. Spanning two floors, they carry books on different topics, both fiction and nonfiction. While browsing around though, I noticed that some books are priced higher than those sold at Page One, although the difference is not too substantial. One good thing about Swindon is that they actually have a bargain section – one on each floor. On the ground floor are mostly general fiction books although there are also some reference books on different topics. Some are discounted by as much as 80%! The upper floor, meanwhile carries a hodgepodge of books on computers, cooking, entertainment and other topics. What's great about their bargain section is that the books are greatly marked down but are still in excellent condition. Price range: Most books are sold at full price. Bargain books are sold from HK$10 to HK$100. Overall: Great selection of books, great bargain selection. This small bookstore exclusively carries children's books, which is perfect for people like me! And when I say children's books, I mean the whole gamut of publications that include young adult, picture books, activity books, references, pop-ups, classics, activity kits, learning modules, coloring books, joke books and comics. The books are neatly arranged by genre/type so it's easy search for books. Unfortunately, they don't have a bargain section. Price range: All books are sold at full price. Overall: Comprehensive collection of children's books; easy to navigate. Apparently, there's another secondhand bookshop in the Tsim Sha Tsui area along Haiphong Road called "The Traveller's Home". It's a place for backpackers and sells mostly travel books. While walking along the street, I spotted the store's sign, indicating that it was on the second floor. However, after climbing up two narrow flights of stairs and passing an internet cafe, manicure salon and finally, a tattoo studio, I finally gave up. The store was nowhere to be seen. I might have missed the opening hours/days - I don't know. It would have been interesting to have visited it, though. And that concludes my book hunt in Hong Kong. It sure made me appreciate our own secondhand bookstores in the Philippines - where books are much cheaper! The store is only a few blocks away from the Central MTR station and is located at the bottom of the escalator at Queen Victoria St. I actually missed the entrance and went up the escalator when I spotted the banner (the one in the picture) from the second floor. In Hong Kong, the British system of designating floors is followed - so the address actually refers to the second floor equivalent in the Philippines, because what we consider the first floor is the ground floor to them. Thus, I had to climb up a narrow flight of steps, with only a couple of reassuring signs pointing to the bookstore. The sign outside said that they opened at 11:30 am, and we arrived there at around 5 minutes to 11. (Woke up especially early that day!) The owner was accommodating enough to allow us in to browse around. The bookstore's quite small, but organized by genre. They've got quite a selection of general fiction, (around 3 tall shelves, alphabetically arranged) and young adult books (3 smaller shelves). There's also a shelf for science fiction and a couple of shelves for thrillers. They've also got a section for large hardbound general fiction (the type I love to collect) and a few coffeetables, picture books and nonfiction books. The books are in fairly good condition and many titles are quite recent. You could also bring your old English books in exchange for store vouchers. Stuff I bought: Cirque du Freak Books 10-12 by Darren Shan (HK$35/book); Ptolemy's Gate by Jonathan Stroud (hardbound, HK$45, from HK$179); Remember Me by Sophie Kinsella (hardbound, HK$50); and a book about Bianca Castafiore, hardbound, for HK$50 (from HK$95). Overall: Neat little bookshop with a good variety of books (mostly new or in good condition) sold at greatly marked down prices. Further along the same street as BooksMart, there's another secondhand shop that buys and sells not only old books but CDs and vinyl records as well. Again, it's a floor up. Just as I was growing skeptical at the huge water pipes that lined the walls of the stairs, a bookstore about twice the size of BooksMart emerged. However, about half the space is dedicated to old records. It's a dim shop with dark, towering shelves. On the counter sits a functional record and CD player so customers can preview what they buy. The store carries a selection of general fiction (mostly mass market and trade paperbacks), although not arranged in a particular order, so you have to be patient in scanning the titles. Some books are piled inside boxes, ready for rummaging through. What's unique about this bookstore is that they have quite a collection of classics, from the recent versions (the kind that's printed in series) to old crumbling editions with cracking covers. I spotted couple of old books by Alexandre Dumas that sold for HK$120, but they were in pretty bad shape. They have other special edition classics as well (if you're the type who likes books whose pages are gilded in good). There's also an entire shelf devoted to Shakespeare - not just his works, but biographies and books that investigate the mystery behind the authorship of his plays. There are also shelves of big hardbound books about music, art and pop culture, and shelves devoted to psychology, history, military and war. Not too many children's books and young adult books though. Overall: Great for those who love old books, classics, hardbounds and nonfiction. A bit disorganized, though, but I guess the thrill is in the hunt! Walking straight along Queen Victoria Road towards Connaught Central, the street becomes Cochrane St. (slightly to the right of Queen Victoria Road). If you straight up the street (it's literally uphill) until you reach Lyndhurst Terrace, you'll find Flow, another second hand bookstore. The entrance is a bit tricky to find, though - it's not actually facing Lyndhurst Terrace, but a bit further along Cochrane. It's slightly obscured by food vendors, but there's a stairway (again!) on the left hand side with an arrow pointing to the store. Flow is crammed with books, and the inside is quite cramped. The space between the shelves permit only one person to pass through. Despite this, it's the cheapest of the secondhand bookstores I've been through. There are two tall shelves back-to-back full of recent general fiction (trade paperbacks, mostly, and some mass markets). There are even books still in boxes underneath the shelves. There also carry a lot of self-help books, cookbooks, biographies, coffeetables, and other nonfiction. They've also got some young adult and children's books, and for some reason, quite a collection of secondhand Harry Potter books - mostly UK children's editions. I even spotted a secondhand copy of a specia l edition hardbound Chamber of Secrets (no dustjacket, though, and it was quite expensive). At the time I visited the store, they had an ongoing HK$2 book promo, but they were mostly worn mass market paperbacks (proceeds went to charity). Overall: Cheap, and has a great selection of books. I just wish it was less cramped. 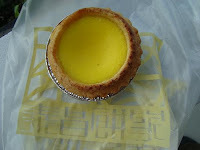 Incidentally, there's this really great little bakery near Flow (along Lyndhurst Terrace, toward Hollywood Road) called Tai Cheong Bakery where they sell really yummy egg tarts for $HK5 each. Apparently it's world famous . It's got a crumbly, buttery and tasty crust filled with smooth, slightly sweet bright yellow custard. It's always freshly baked and best enjoyed hot. Chickoy loved them so much he bought a box of six. Part 2 of my Hong Kong Book Hunt coming up soon!